Figure 5.1 shows models of the interiors of the terrestrial planets that highlight the main compositional divisions within each of them. 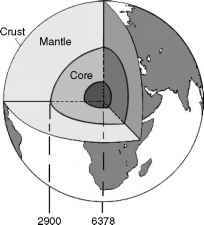 A common feature is an outer crust overlying a mantle, which itself overlies a central core. In considering the various layers in Figure 5.1, it is important to realise that it is cross-sections through spherical volumes that are shown. Therefore, it is easy to get the wrong impression of the volume ratios of the different layers. For example, from a superficial look it might seem that the volume of the Earth's core (inner plus outer) is a bit over half the total volume of the Earth - it extends a bit over half way to the Earth's surface. But the volume ratio is actually about one-sixth. A much better impression is obtained from the cutaway drawing in Figure 5.2. 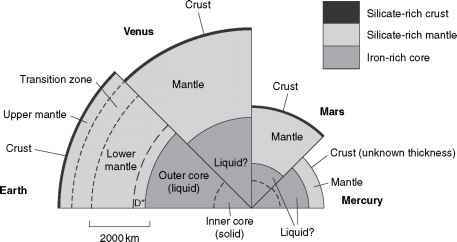 Figure 5.1 Cross-sections through the terrestrial planets. Figure 5.2 Cutaway section through the Earth. been of particular importance in establishing density profiles. 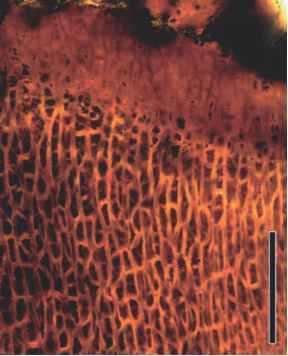 In accord with the observational data, the bodies are shown differentiated, with the intrinsically denser substances lying deeper. Thus, silicates dominate the outer layers, and iron, or iron-rich compounds such as iron sulphide (FeS), dominate the cores. We therefore have rocky materials throughout. Regardless of the form in which a chemical element is present, over 90% of the mass of each of the terrestrial planets consists of oxygen, iron, silicon, magnesium, and sulphur, though the proportions within this group vary from body to body. These are among the 15 chemically most abundant elements in the Solar System as a whole (Table 1.5). Other abundant elements are less well represented, notably hydrogen, helium, carbon, nitrogen, and neon. This is because the pure element or the common compounds, including icy materials, have densities that are too low even at high pressures to fit the density data. It is their volatility that has led to their scarcity in the terrestrial planets. Table 5.1 gives temperatures, densities, and pressures at a few depths in the Earth, and Table 5.2 gives the values at the centres of all the terrestrial planets and the Moon. Note that these are model values, and therefore depend on the particular model adopted, so the values are indicative and not definitive. Note also that for a given substance, its equation of state links the three quantities in Table 5.2, and so in principle if we know any two we can calculate the third. However, the equations are not well known, partly because the terrestrial planets consist of mixtures of minerals in somewhat uncertain proportions, and partly because the extreme conditions at great depths are beyond laboratory reach, though it helps that to a fair approximation in terrestrial interiors we can ignore the effect of temperature on density. In the case of the Earth, the density and pressure versus depth are comparatively well known, from seismic and other data. The temperature versus depth is, however, much more poorly constrained. You can see in Table 5.2 that the central pressures are greater, the larger and denser the body, in accord with equation (4.12) (Section 4.4.3). In Table 5.1 the pressures and temperatures increase with depth. □ Could this be otherwise? In Section 4.4.3 it was shown that pressure must increase with depth, and in Section 4.5.4 it was argued that, given sufficient time, temperature will decrease outwards from the centre.